Would you risk your state’s economy and the health and welfare of its citizens on a theory that has never worked? Well, Oklahoma’s Governor and Legislature decided they would try Laffer’s trickle-down economics again and sure enough it did not work, – again. The budget hole in Oklahoma is now $600 million deep and our politicians just keep digging. 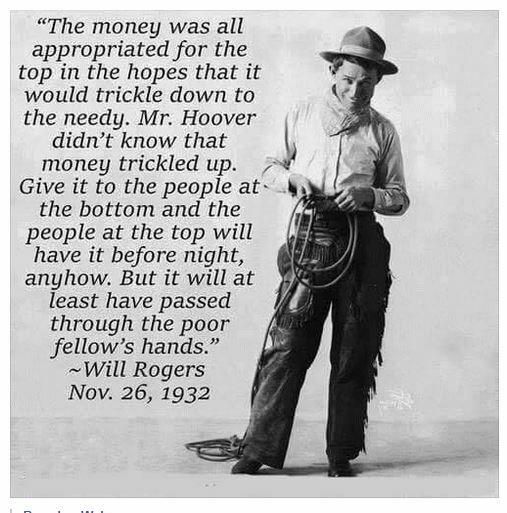 Perhaps they should have consider what our most popular Oklahoman, Will Rogers, said about trickle-down economics back in 1932. Oklahoma is now having to make cuts in education, infrastructure, the salaries of public workers, pension plans, and they are thinking about letting people out of jail because they cannot afford to keep them keep them locked up. Even yet, Oklahoma is cutting taxes even more next year thinking that the problem is that they just have not tried it hard enough. It has not worked in Kansas either. Governor Sam Brownback has put Kansas deeply in debt with his experiment, he calls it, with the trickle-down theory. He cut taxes and refuses to raise taxes even though there is $179 million budget shortfall. Governor Brownback, too, thinks the problem is that Kansans just have not wished hard enough that Tickle-down Theory will work. He is also wishing that the $500 million budget deficit projected for next year will somehow magically go away. Governor Tim Pawlenty tried it in Minnesota and he left office in 2011 with a a $6.2 billion budget deficit and a 7 percent unemployment rate. When Mark Dayton, a businessman an d billionaire, was elected governor in Minnesota he had the good sense to realize that when something was not working, you give it up. During his first four years in office, Gov. Dayton raised the state income tax from 7.85 to 9.85 percent on individuals earning over $150,000 – a tax increase of $2.1 billion. He’s also agreed to raise Minnesota’s minimum wage to $9.50 an hour by 2018, and passed a state law guaranteeing equal pay for women. He was warned that the job creators and corporations, big and small would leave, but they did not. Between 2011 and 2015, Gov. Dayton added 172,000 new jobs, and though Minnesota’s top income tax rate is the 4th-highest in the country, it has the 5th-lowest unemployment rate in the country at 3.6 percent. Will Rogers had the theory right. Money trickles up and pools at the top. Those at the top really like that, and they pour campaign money to politicians who will keep trying trickle-down economics. Governor Dayton showed that tax increases and rational economic policies work, but Oklahoma and Kansas are just going to keep wishing and digging. This entry was posted on Tuesday, February 24th, 2015 at 5:41 pm	and is filed under Oklahoma Politics. You can follow any responses to this entry through the RSS 2.0 feed. You can leave a response, or trackback from your own site.